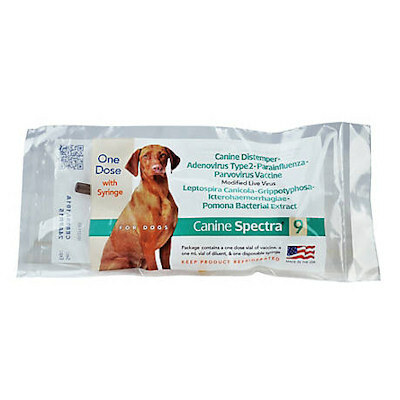 Spectra® 9 Canine vaccine(Boehringer-Ingelheim)(Same as Solo-Jec 9)(9-way single dose dog vaccine with syringe + needle) is a combination of immunogenic, attenuated strains of Canine Distemper, Canine Adenovirus Type 2 (CAV-2), Canine Parainfluenza, and Canine Parvovirus Type 2b, propagated in cell line tissue cultures. Administration: Inject single dose SubQ. Give puppies first dose at 6 weeks of age, re-vaccinate every 2-3 weeks until at least 16 weeks of age. Vaccinate all dogs once annually.